Hydrangea plants (Hydrangea spp. ), suitable for U.S. Department of Agriculture plant hardiness zones 3 through 9 depending on species, are beloved for their large, showy blooms that come in a range of vibrant colors. While generally easy to establish and grow, hydrangeas will become stressed under certain conditions. Over time, if these causes are not addressed, hydrangeas can start to wilt and droop. Reviving a struggling hydrangea plant depends on correctly diagnosing the problem and remedying the situation correctly. Possible causes include not enough water, too much water, too much heat and shock from transplanting. Blue hydrangea bushes grow in a garden. Hydrangeas are thirsty plants, preferring moist, well-draining soil. If the soil becomes dried out, they will visibly wilt. Water at least 1 inch per week during the regular growing season, and more often during hot periods with little rainfall. While hydrangeas love water, they do not tolerate standing water well. Because of this, work lots of compost into the soil before planting, to improve soil structure, using a 3 to 1 ratio of soil and compost. 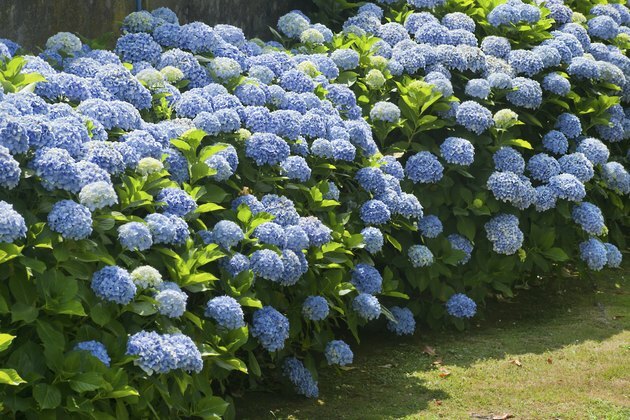 Heavy clay soils that compact easily are dangerous to hydrangeas as the roots can easily become suffocated. Sometimes, even with enough water, hydrangeas can wilt as a result of heat. High summer temperatures — over 86 degrees Fahrenheit — can stress plants out. While hydrangeas enjoy sunshine, too much direct sun can cause the soil to overheat, stressing the plant and causing it to wilt. Hydrangeas benefit from growing environments that provide some shade relief, especially in the afternoon. If adding shade is not possible, water more frequently to reduce heat stress. Mulch hydrangeas yearly to help retain soil moisture, keeping the ground near hydrangeas cooler and less susceptible to rising temperatures. Put a layer of mulch 3 to 4 inches thick around the base of the plant. Create a hole in the mulch roughly 2 to 3 inches away from the plant stems. This will prevent mold and mildew formation while helping preserve soil moisture. Hydrangeas are easy to move, because while they are wide, their root systems are compact and not very deep. However, transplanting can shock a plant, causing it to wilt soon after the move. To minimize transplant shock for a hydrangea, move the plant to a hole that is 2 to 3 times the size of its root ball. When uprooting the plant, dig as deeply as possible, to get as much of the root ball as you can. Before transplanting, work the new soil with fresh organic material to ensure your plant gets as much nutrition as it requires in the beginning. Water your plant immediately after transplanting to reduce the risk of shock. Hydrangeas thrive on their own with little maintenance needed if they are planted in ideal conditions. Cold, windy areas, such as east-facing gardens, are not ideal as the harsh winds can harm early growth in the spring. For healthy hydrangeas, cut off dead flowers as they appear to encourage new growth and blossoms. The more vigorous the plant is, the less likely it is to wilt, as it is more tolerant to stress.